What led us to this little earring item was the thought of creating a design that is tiny yet with an impact. This item is one of the smallest we have made so far among all our creations made in nylon plastic. A little flower with petals in the form of thin strokes similar to the Mimosa Brooch in our collection. This delicate design is hand-dyed in soft blue color in a pastel gradation where the tiny dotted tips of each petal is left as white. 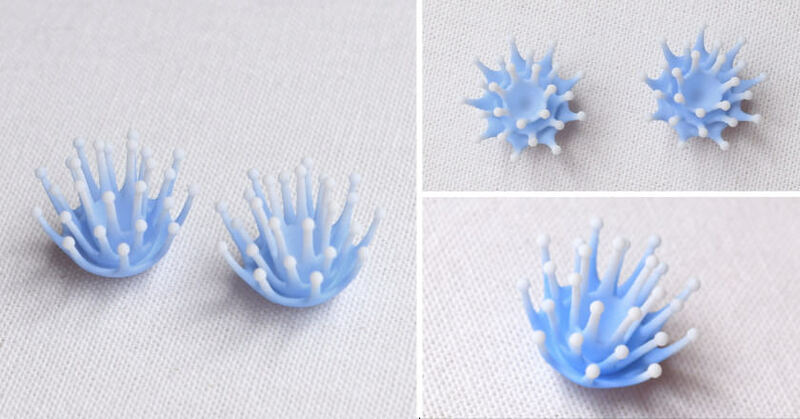 The item is also reminiscent of little crowns of splashes appearing as water droplets falls onto the surface of a water pool. Similar to Shell Earrings, this item can be made in a variety of colors, so do feel free to tell us your preferred color by contacting us. This item will be officially launched for sale from May 1st, 2016. It will also be featured in the collection we are bringing with us to the minne handmade market this end of April!